Li150 seized. What do you think. It would run ok then nip up, dropped a piston ring, then starting problems. Bgm...ignition do they run on gp cranshafts or Li type? I know nothing about them. Can you just buy a new flywheel? You will need to buy new bearings, and a new flywheel possibly electonic ignotion. If its an li cranshaft all you need to do is split it and get a new bigend bearing. I never advise buying engine parts from ebay..as i have bought stuff that has turned out to be next to useless...i binned it and bought from reputable dealers. That said I googled evilpay america and found a li150 cylinder head in Nevada..$35..doesnt seem a bad price. If you buy a new cylinder kit...in the future..you will probably need a good quality gp cranshaft and new bearings throughout and a bigger carb and exhaust and probably need to fit a new clutch. The costs soon mount up. If you change to good quality gp crank and bearings now...it future proofs it so that if you feel in the future you want more you have the crank and bearings fitted and stator. You then just need to figure out which kit you want and what carb and exhaust. I suppose it all depends on what you want from the scooter and how long you will be keeping it before spending a fortune on it. 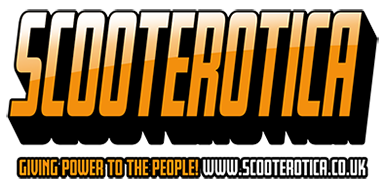 The reason I asked if you have joined the lambretta club of usa...is that you may know of some already..or there may be memebers near you who could sell or help you out with parts for your scooter. They may have upgradraded their scooters and have the parts you need. Here is a link to the pictures. The head is not shown as it is fine. The cranks is an Li crank and apart from having rust only seem to have the bearings gone, The piston is pitted but I cleaned it up to see what kind it was. The cylinder is original and you can see the big score mark. Inside the crankcase you can see how much crap is in there, also some gouges from the debris being dragged around. I will clean and smooth out the case, the drive side bearings though seem pretty good. Definitely mag side seals and bearings, though you can see not too much seepage. so here we are. I am staying with an Li crank as the electronic ignition setup is all new. crank shaft replace or repair. All looks reusable to me, piston is standard so plenty of scope for reboring, dont worry about that broken bottom fin on the cylinder although you could clean it up with a grinder so it doesn’t look so obvious. If your sticking with the li crank as I said before you can have a rod kit fitted by a dealer or alternatively a new li crank wont break the bank, so everything considered should be a relatively cheap build. Your not sure whether its been bored to the correct size................if its been bored out to big,then your stuffed. I just left the machine shop, he will rebore mine for $35. I can get an original hepolite 3rd over size piston for $35 on ebay. Its new old stock and I know hepolite pistons are good quality. Tameni li 58x107 crank for $149. Sounds like the way to go to me. New seals and bearings and a good cleaning up. I've never witnessed the failure of a smaller taper crankshaft, but I wouldn't buy one if a GP taper could be utilised with what you have. You would surely kick yourself if you wanted to upgrade the engine further @ a later date. If it were me, I'd ask the manufacturer, but failing, that the machine shop, the feasibility of boring the flywheel to suit the GP taper. Personally, I have done this many times with race flywheels such as Motoplat & Selettra. As for the piston, the cast iron rings are so thick that I'd sooner buy a thin, chrome ring piston (such as Scooter Restorations type) & have the provision for some tweaking @ a later date. If you're handy with a dremmel, it'd probably be worth adjusting the barrel to be the same sort of spec as an Italian GP one. It wont make it a racing snake. But should make it a bit less lethargic. Regarding the Crank, having a brand new Li bgm ignition on it and not having a desire to move into any major tune yet it seemed reasonable to stay with a good quality li taper. The modern ones last well and MB say the one I am getting, not through them as they cant get them any more, would be suitable for a tuned kit, though they say consider a gp type. It is different material to the old innocenti cranks and much more tougher. It will be here tomorrow and the new bearings and seals will be here too this week. I am still looking at the scooter restorations pistons though and would have gone that route if I had feedback on the quality of their standard pistons. I am still looking at this Indian kit https://www.ebay.com/itm/New-Lambretta- ... ctupt=true but I have no idea of the quality. It would be perfect otherwise, even for looks. Anyone have any experience with these units? I am getting top bearings and viton seals from MB so trying to get some longevity here. One last worry, in the crank case between where the webs are, there are good size gouges from where the needles from the big end probably were dragged around, any thoughts on the effect and possible problems. I remember a few years back on some small 75cc engines cracking the case after damage from bad bearings scratching the case. One other good bit of news is that my 3rd edition Complete Spanners Manual has shipped so I can get some info there. To be honest, I am pretty pleased with my progress so far, thanks to you tube and encouragement here. Muttley , I am pretty damn handy with a Dremel as I do a lot of fabbing for the old rolls and the marine engines. What mods are you talking about on the barrel. The bike ran really nice with the setup it had but minor tweaks later might be ok. I want to learn to time and tune this with its known configuration first though. The rt195 I think is in my future though.